They fight evil and battle bad guys, but that’s not all that makes Mr. and Mrs. Incredible amazing. They’re also raising a family. And that, according to producer Nicole Grindle, also makes them heroes. So what is this feisty family up to now? Let’s take a look. In this film, Helen is in the spotlight. “She’s doing a great job helping to rebuild respect and acceptance for Supers everywhere so they can become legal again, while Bob handles everything at home,” Grindle explains. But when Helen finds out about Jack-Jack’s emerging superpowers, she has to try to stay on top of her Super job and be a Super mom, too. “It takes a lot of flexibility but luckily, Helen proves up to the challenges,” says Grindle. Bob would love to be battling bad guys by Helen’s side, but family comes first. 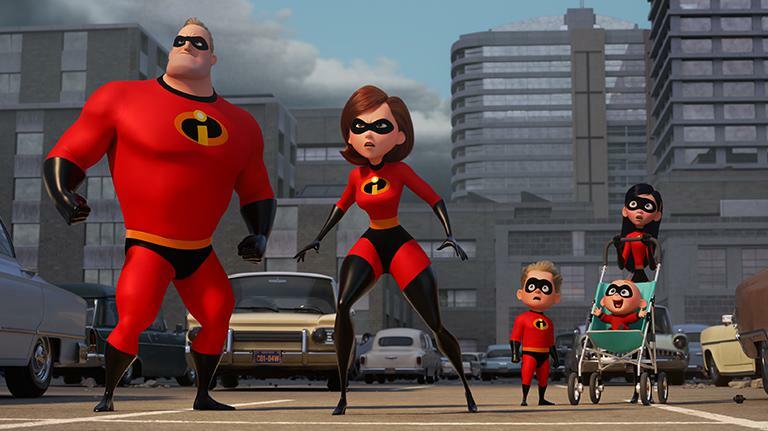 When Jack-Jack’s superpowers reveal themselves, Bob is excited, but also a little overwhelmed. Meanwhile, Violet and Dash are throwing their own curveballs and Bob has to summon his own superpowers to juggle it all. Any parent who’s watched a teenager going through the throes of first romance will identify with Violet’s teenage angst—which can be a force field unto itself. She’s so focused on her problems, she doesn’t even notice Jack-Jack’s new abilities. But Violet is a Parr at heart and she knows how important family is. Dash’s signature speed won’t help him with his latest challenge. It’s called M.A.T.H. He is beyond frustrated by the subject and somehow just can’t get up to speed no matter how hard he tries. It takes all his attention—and a little help from Dad—to get it figured out. As you’ll recall from the end of The Incredibles, the villain Syndrome is the only one who actually sees what Jack-Jack can do. So when the toddler starts to reveal his powers, it’s a huge surprise for his family. Add the fact that Jack-Jack is at an age where the word “no” means nothing! (We’ve all been there, right?) But luckily for us our toddler’s tantrums aren’t as superpowered as Jack-Jack’s! When all is said and done, the characters are still just as fresh, friendly and fun as ever. You’ll also meet Edna Mode, Frozone and a brand new villain. “It’s a joy to see these characters again,” Grindle says. And we think you’ll agree. The flamboyant high-end fashion designer plays a very important role. And she still has strong opinions about capes. Back with his super-chill act. But this time he may have met his biggest challenge ever – helping Bob care for and corral Jack-Jack. Voyd is a young, overeager up-and-coming Super and a mega-fan of Elastigirl, with the ability to divert and manipulate objects around her. Supers need villains to battle and there’s a new nefarious ne’erdowell, who is taking over screens around the world from phones and computers to televisions. Can the Supers turn him off? Stay tuned!